This was inspired by a photo taken of my grandmother (Nanny) by my uncle and given to me by my mother. It is a photo that speaks of the love and history between a couple as their journey on this earth has come to an end. It is definitely a photo that speaks a thousand words. This is not only for my grandparents but all of those couples that have battled life together and miss their battle partner and to those of us aspiring for this type of marriage. How do I say goodbye? For this I have no answer. I look down at my hands bent with age and instead see them as they were when you first took my hand when we were a couple of kids just trying to figure out this life. Then as they were when you took my hand in marriage and we were two kids saying we would figure out this life together. I bring my hands to my eyes to wipe away the tears and I am brought back to all of the times I brought my hands to my eyes as I attempted to wipe away sleep during those sleepless nights with infants. Babies who only seemed to be content in my arms. That was okay though, I savored those moments staring at their little faces seeing the pieces of you and me brought together in miniature form. Wondering if they would have my smile or your sense of humor. 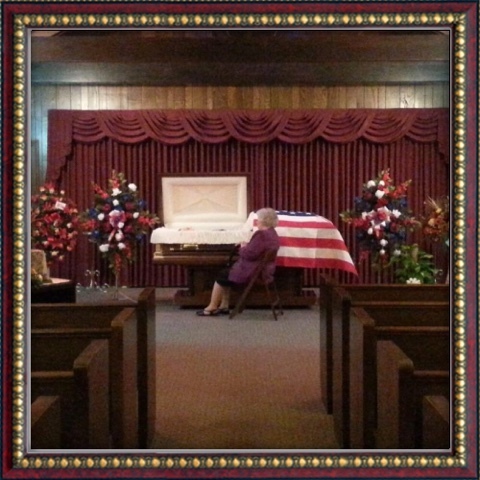 I touch the flag draped over your casket and again the years melt away as I remember. Together we battled a war. You protected and maintained our country's freedom and I worked to protect and maintain our family. No life has not always been easy. As I sit here unable to stand on my knees for long periods of time I remember all the times that life brought us to our knees. Life hasn't always gone the way we thought, then again life rarely does. Oh but darling the things we have gone through, together. So no I'm not ready to say goodbye. While one might look and see nothing more than a little old woman sitting at a casket of a little old man; I see a lifetime lived. A life time of love. It's not their fault, for they weren't with us on our journey. While they see you laying here in your suit, they are not transported back to the day I helped you into your suit jacket as you prepared to walk our little girl down the aisle. They can't imagine all of the memories that are ours alone. They were not there for all the whispered conversations in the dark or early morning talks. My mind and heart remember the birthday parties, anniversaries, holiday dinners, and other moments that found us together as life played out around us. Even as the years appeared to speed up and our bodies slowed down, life found us together.